Here's my WND column for this weekend entitled The Palm of the Hand on the Seat of the Pants. I took inspiration from this Bizarro cartoon. My parents were able to discipline us and my greatest fear of bad behavior was the leather razor strap of my father. Now, granted.... this could if carried to extreme and be a form of abuse. It had the desired effect on me, in that the pain was something to be avoided at all costs. This may be considered the ultimate capital punishment in the administration of discipline to a child. So, that said I did not use this as a form on my two boys but I had it as an option if necessary. I see the "time out" generation and what it has produced and find it disturbing to say the least that ALL forms of discipline are not considered appropriate for parents. A strong willed child is posing the question. Who's the boss? When it comes down to it. The correct answer is.... Dad or Mom ( or in our case) Papa and Grammie (when they are under our roof). Authority rests with the parents and we will rue the day when the society (or state) imposes what they deem a "better" idea. We are seeing it demonstrated constantly that as society turns away from self control and discipline of our youth, the breakdown of society occurs and will continue to do so until we change back to the "old ways"... The wheel is not replaced yet and shouldn't! Thanks again Patrice for you insight and wisdom! Keep it up! I agree that a razor strap is abuse, and I got even worse than that when I was growing up... MUCH worse! (My mother was an alcoholic and would become extremely hateful when she drank.) BUT, there were times when I just got a good "licking" that I DID deserve and I knew I deserved it. Those were times when my mother had not been drinking. She could be quite sensible when she stayed away from the booze. My wife's father was also an alcoholic and she has many bad memories, as well. We both have never drank any form of liquor because of our childhood experiences! No booze, no tobacco, no drugs. NOTHING addictive, ever! Our children were very seldom spanked, but if they were disrespectful or talked back, they got their pannies faddled good. They minded or ELSE! And they knew it. My father never used the razor strap to excess and did not suffer from alcohol issues. Thank God. I think the full range of punishment should be available to parents without any government, society, or family interference. Now, that said, if a parent DOES cross the line then the full weight of family, society, and or government should come down on them. Sadly, it seems the government continues it's progressive ways and wants to intercede BEFORE sometimes even the facts are know. Michael Brown was probably such a child. He had no training in simple discipline or respect and when confronted by police officer Darren Wilson he told him that he wasn't *bleep* enough to stop him and turned and charged the officer. Michael was NOT going to be intimidated by a "honky" little policeman. Having ht and wt advantage over officer Wilson, he had NO CHOICE but to defend himself. Did he make the right choice. Twelve of his peers on the Grand Jury thought so. Let's let it go. Folks, when the police are not able to defend themselves from thugs, thieves, etc. just what have we become? A nation that is a shell of what it once was where there was a respect for others and property. 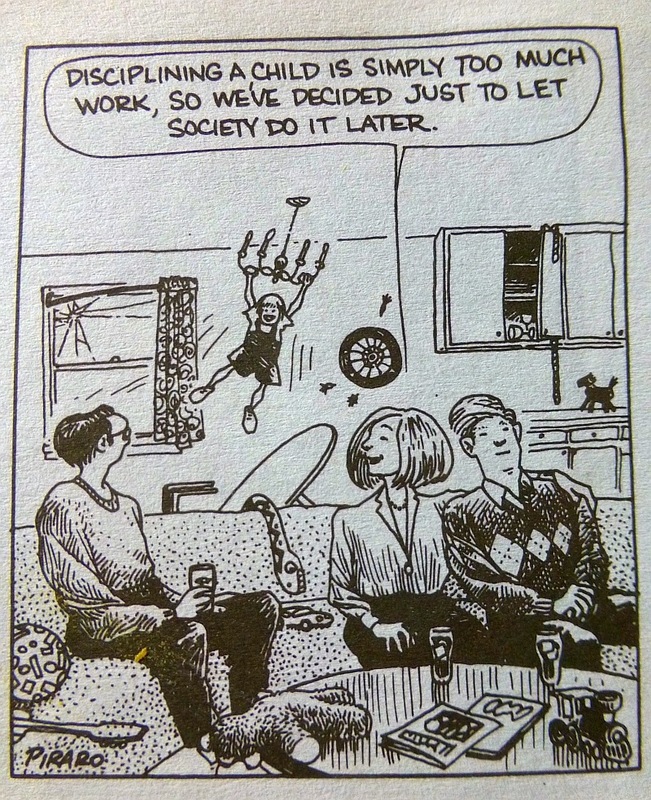 My daughter was a quiet child with a lot of self-control, Still I had to administer a swat on the bottom a time or two. I well remember an incident in a small bookstore that the two of us often visited. She was about four and had permission from the owner to look at books for her age level to find what she might like. While we went about our shopping (and looking), a woman came in with a boy about my daughter's age. After a few minutes he pulled over a display. His mother immediately said " This little girl knocked over the card display." and left. My daughter looked tearfully at the owner who said "Don't worry. I know that you are always careful. That boy is no longer welcome here." I thought how sad that the boy was taught that lying about things was acceptable, as was damaging or destroying things, What a terrible lesson to teach a child. We were very well behaved. It's how we were raised. I do know that family depicted in the cartoon. Their kids went out in the world, freaked freely, got put in jail and now live in their parents' basement. Patrice, I may be your only positive comment on this state of humanity here. You see, I am a Corrections Officer (prison guard in a Level 5 prison) and this same mentality as portrayed in the Bizarro cartoon is what will keep me employed for the next 500 years. Parents, if THAT doesn't get your attention, nothing will. Truly, if kids don't get trained and disciplined properly while growing up, it is up to the prison system to do it later - in a much less 'loving' way. Wisdom from the trenches. Talk about job security, sadly. If you ever want to write a guest post for this blog, let me know. I have to disagree. Obviously if you don't take the effort to patent, you put your kids in daycare all day, and you try to buy their love with buying them things and always saying yes, then yeah. You get brats. However, you can still raise respectful, kind, confident children without hitting them. It involves not overindulging them, holding them to high standards that you yourself model, and giving them tons of love and attention in their earliest years so they feel secure their whole life. Anyway, I'm not here to judge you as obviously your kids have turned out lovely, but please don't be so dismissive of those of us who choose alternative styles. I myself was not spanked and turned out just fine. In conclusion, not hitting and not parenting are two different things. I was limited on my word count in the column so I had to remove some links showing the efficacy of time-outs as a discipline tool. It's not necessary to spank as long as other disciplinary strategies are used. A close friend was abused as a child and vowed never to spank her own child, but she used alternative styles and kept strict discipline in their home. Her child turned out beautifully. As you say, not spanking (which differs from "hitting") and not parenting are two different things. We viewed discipline and punishment as two separate entities. Our children were disciplined along the way, with punishment being for flagrant violations of known rules. Lots of push up and running half mile laps around the property perimeter, often holding hands with the other parties that were involved (we had a no arguing rule) had the added bonus of our kids being praised at school during PE for being able to do a push up and for being nonstop runners. Second son had the fastest two mile time, to include all high school students, lol. Bonus being, none of the nanny-state liberal do-gooders in western WA could have DFS come and "investigate". That said, Third son does a mean imitation of Walter Matthau from Dennis the Menace, "You see, Mitchell, when I was a boy, when my old man had something important to say to me, he said it with a belt." I was spanked, my brothers were spanked. I don't remember it happening very often, it was really rather rare. We didn't break the rules because we knew there was no getting out of that spanking. I don't remember any specific spankings and all of us still love our well-seasoned 80-something parents. We also respected them growing up and still do. The vast majority of parents who abhor the thought of spanking their child think nothing of sending their child to government schools. Now that is REAL Child Abuse. 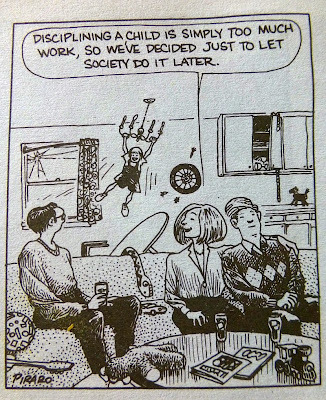 You know why modern child therapists seem to consider all forms of discipline too harsh, right?? Because the same toddlers who aren't disciplined today will be the kids they're getting paid to treat for ADHD, ODD, and a fistful of other disorders five years from now. I'm not saying those things don't exist as actual neurobiological entities-- as the ASD wife of an ADHD man raising at least one, and maybe as many as three, ADHD kids, I KNOW they're real. I also know that both my husband and I beat the "clinical odds" allegedly stacked against us because we were blessed with parents and other adults who took the time to care, the time to teach, the time to understand, and the time to apply thoughtful discipline. Not disciplining children-- including punishment in some form when they willfully break a known and established rule-- isn't love. It isn't peaceful parenting, or understanding, or tolerance. I had all those things growing up-- and I had discipline, too. Why?? Because I had parents who understood that the failure to discipline a child is just another form of neglect. Years ago, a child psychologist gave me the best advice ever. A parent knows his child better than anyone else in the world. Using your knowledge of the child, follow your own instincts to lovingly discipline your child. Do not let your parents, neighbors, friends or relatives convince you to act otherwise. We did spank our children. We also used time out, removing bedroom doors, grounding their cars, etc. Our son had a very difficult time growing up. At 16, he decided he could no longer tolerate our rules. We had a lengthy and lively discussion. He was told he had to follow the rules or he had to leave. We also ensured he knew he could return anytime as long as he agreed to our rules. He decided to leave. Once he was gone, I cried & prayed that we had raised him well enough that he would see the error of his ways and return soon. Everyone we had ever known called an told us how horrible we were but we stuck to our guns. 2 days later, he called and said if he could come home he would follow the rules. This was a major turning point in his life. He didn't change overnight, it took another 8 years from him to grow up. But now at 41, he's an excellent father and has his life in order. When raising children, there is no one size fits all.